$759,000,000 was lost by companies because of employees using the internet for personal reasons during work hours. At first glance that is a horrifying loss of potential income. This morning I ran across this info-graphic about howmuch time is wasted by the average employee and how much money it was costingemployers to potentially be losing. Dramatic? Yes. Accurate? Maybe. Relevant? No. Simply providing data without diving deeper into the reasoning behind how the data came into existence seems a bit shallow at best. I’m more interested in approaching this cognitive path from the other end. One statistic is, “the average worker admits to frittering away 3 hours per 8 hour workday, not including lunch and a scheduled break.” Let’s do some math then, 8-3=5-1=4-:30(2*:15)=3:30/3.5. Instead of doing 8 hours of work the average worker admits to only doing 3.5 during “normal work hours.” So what is “normal” and why are those hours chosen? Is the logic that lead to these normal hours even applicable to our culture now? These normal working hours are referred to as the Eight-Hour Day Movement. It all started because working conditions were unregulated in Britain during the Industrial Revolution when large factories were booming. It was a mechanism to limit abuse of laborers and children from working 10-16 hours a day. The International Workingmen’s Association took up the demand for an eight-hour day at its convention in Geneva in August 1866, declaring The legal limitation of the working day is a preliminary condition without which all further attempts at improvements and emancipation of the working class must prove abortive, and The Congress proposes eight hours as the legal limit of the working day. 1866 is where this all started. When this eight-hour day movement was being initiated it was to protect workers from being over worked in factories because they were production-based jobs. You could spend endless hours on an assembly line or in a factor, so it makes perfect sense that this was a logical and humane course of action. We don’t have many factory jobs anymore, we have moved on from the industrial stage and working looks a lot different today than it did even 20 years ago, especially different from 1866, 145 years ago. Is it not a bit odd that we still use a system suited from a 145 year old culture? I’m about progress and don’t think much can be made without challenging or at least intellectually considering current systems. Considering how much the working culture has changed then it seems unrealistic to even expect someone to sit at a desk for 8 hours fully focused on one project or task. The idea of multi-tasking was foreign when the eight-hour work day was established. For a person to be unable to multitask at work now is a downfall. 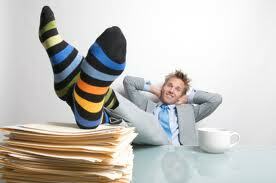 Multi-tasking is something asked about in interviews and is a quality highly sought after by recruiters. With the advancement of culture, most specifically, social media and how we communicate, there are so many tools out that we naturally multi-task, without being paid. We tweet, update status, post pictures, check-in, change our profile pics, and wonder who the mayor on FourSquare is all while waiting in line at the BMV. With the large amount of resources on the internet now, being on Facebook and Twitter actually may help a worker. I recently invited my boss to a business webinar I found on Twitter. I found this on twitter during normal working hours because I use this social media for work and personal use. I think that the separation of work and personal has become skewed because availability of resources at a non-stop frequency. I know that I am working this weekend to provide some coverage for a big storm that hit in California, but I also know that I am not going to stare at my laptop for 8 hours. When I see something that needs ot be done or can make something better I will do that, however, just sitting still because it’s what I’m supposed to so even when nothing is going on is something I think my culture struggles with often. Because we are a culture of constant communication via social media and multi-tasking focusing on only one thing at a time for only a set amount of time is counterintuitive and archaic. We are no longer in Britain in 1866, but still operate under a system built for that place/time. It’s obvious progress is needed in this area, but the challenge is what do these changes, that are so desperately needed, look like?